Google has a multitude of services and it’s hard to keep them all straight most of the time. What’s important to growing your business and what can be put on the back burner until you figure out how it works? A Google service that you should definitely NOT be slipping on is claiming your business. What does claiming your business even mean and why is it important? Google My Business is a free, super easy to use tool for your business. This is another way that you can manage your online presence. Managing the information that Google users see when they search for your business or products is very important and makes you seem more reputable. When you have claimed your business or products on Google you are able to update pictures of your store front or products, your hours of operation, website, and street address. Interacting with your customers is huge and claiming your business is just another way you are able to do so online. When you claim your business you also have the ability to respond to reviews whether they be positive or negative. How can not claiming your business be harmful? Not claiming your business if definitely NOT a good idea. As I mentioned previously an unclaimed page looks bad and not as reputable. It could be displaying the wrong information, or even worse someone could have already claimed it. Having to reclaim you business is super inconvenient and time consuming. If you would like more information on how to go about claiming your business check out this link. 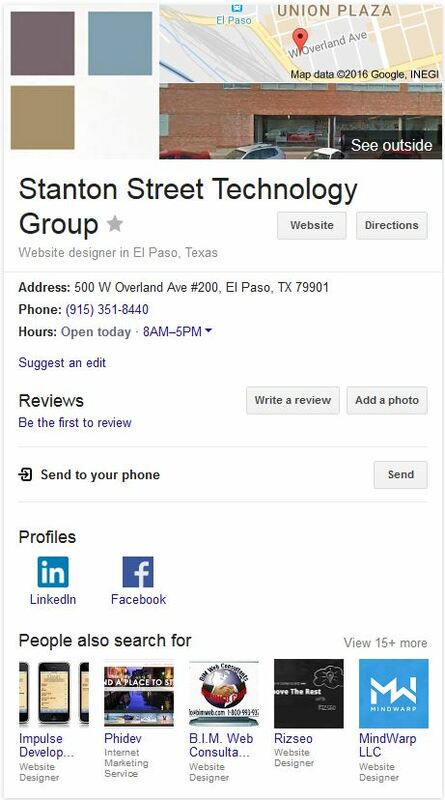 You could also give us a call at 915.351.8440 and we would be happy to point you in the right direction and in the meantime, take a peek at our beautifully claimed business.